This artwork is a purposeful aside from the Maori/Pakeha contact based ideas my work usually encompasses. It celebrates the Polynesian connection and the myriad of black line, sea and sky based images that have inhabited the New Zealand pop art scene for decades. "Ghost Who Surfs" carries on the tradition of Phantom styles but as usual with my work sheets him back specifically to New Zealand. 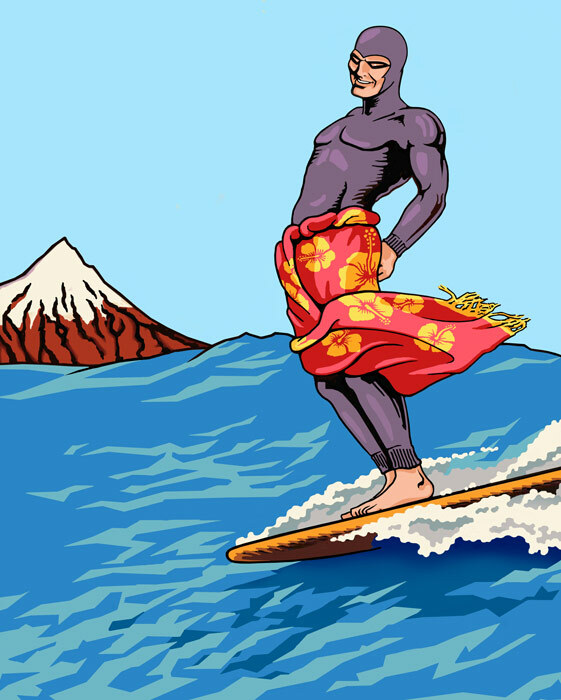 On this occasion it is in deference to the Taranaki surfers, who I know a few of and their huge love of the sea and mountain. They are so passionate and so consumed by the visceral connection, the excitement bubbles from them as they talk about that place and those waves. I am hoping it is at once, amusing and uplifting and a reminder of how blessed we are to live out our lives in a paradise that most people in the World cannot dream of. Even the Phantom has dropped his gun belt and kicked off his boots.